Guana Tolomato Matanzas is one of 27 Estuarine Research Reserves in the United States. Inside this 60,000 acres of salt water marsh and mangrove tidal wetlands, is a new 20,000 sq. ft. Environmental Education Center open to the public 7 days a week. The purpose of the Environmental Education Center is to educate the public regarding the sensitive natural ecosystems, the wildlife living here, and steps we can take to protect and maintain this environment for future generations. 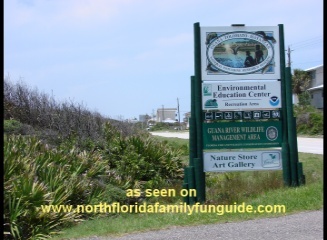 The Environmental Education Center has electronic interactive displays, a 20 minute video overview of the Guana Tolomato Matanzas Estuary, 3 living aquariums, interpretive nature walks, and children's programs regularly. Some of the upcoming activities include, A Creature Feature, which is a real live animal encounter, such as a snake,or turtle. A Nature Movie,Interpretive Nature Walks, and Family Hour, which includes a craft and a story. There are Indian artifacts, fossils, and marine specimens, to view, as well as interactive learning stations, fun quizzes, and replicas of wildlife found in the surrounding areas. The Nature Store, inside the Education Center is filled with interesting books, gifts and toys related to florida wildlife. All proceeds from this store goes back to help fund some of their programs. There are hiking and biking trails throughout this Reserve, and several boat launch areas to explore the Guana River dam area. Sea Turtle Season runs from May 1st through October 31st annually. The Sea Turtle Patrol is a volunteer program which monitors and evaluates sea turtle nests on the Reserves beaches. You can be a friend of the Sea Turtle Patrol by adopting a turtle nest with your troop, club, or school. All sponsors receive a certificate of adoption, an adopt a nest button, information about sea turtles, and updates on your adopted nest, with pictures and final report. Contact Angel Gonzalez at 904 823 4500 for more information on this program. The Guana Tolomato Matanzas National Estuarine Research Reserve Educational Center is a fantastic educational resource for your troop, club, home school, or class field trip!